We’re flying one lucky Golden Issue winner and a guest to La Jolla for a romantic and relaxing long weekend at The Lodge at Torrey Pines. We spoke with Amy Harrick, the mastermind behind the mini-moon and the co-founder of Ceremony Magazine for more details on her Golden Issue giveaway. How did you come about publishing your own magazine in the first place? When I was in my late 20s, I was working in advertising and planning my own wedding. There were no blogs or social media at that time (I’m dating myself! ), and wedding magazines were very mainstream and limited. We moved to California and saw a huge niche opportunity for more of a luxury wedding magazine that truly showcased the talented wedding professionals and amazing venues here. What’s been the most challenging thing? Working with my husband! He created Ceremony with me. What’s been the most fun and rewarding? Working with my husband! Really, working with him is both challenging and crazy fun, but the most rewarding part of my job by far is connecting engaged couples with like-minded wedding professionals. Nothing in this job is better than when a photographer calls to tell us about an amazing wedding they just shot of a couple who found them in Ceremony. What was the inspiration behind the mini-moon? It’s so easy to get caught up in the wedding planning process. When putting together the Golden Issue package, I envisioned this experience as more of a pre-wedding respite than a post-wedding honeymoon. A chance to reconnect and focus on what matters most. Of course, this is great for any phase you’re in – engaged or married for years! Tell us about the beautiful hotel you chose. Luxurious yet unpretentious, to me. 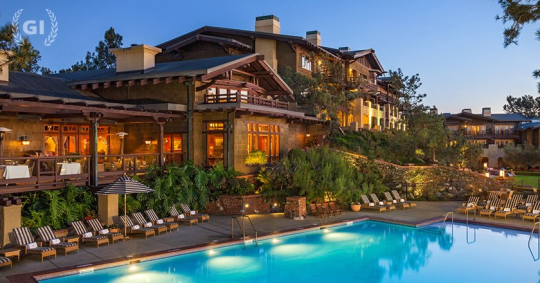 The Lodge at Torrey Pines evokes a quintessential California romantic setting in one of the state’s most beautiful oceanside towns. Plus, it doesn’t hurt that it overlooks the Pacific Ocean AND a world-renowned golf course! We’re giving the lucky winner a credit at the hotel so they can take advantage of the beautiful spa or play a few holes. You really don’t need to leave the hotel ever – it’s so special. Anything else you’d like to share about the details you’ve pulled together? We’re treating the winner and a guest to a dinner overlooking the Pacific Ocean at George’s at the Cove. It’s a must-do when visiting as the food and the view are phenomenal. To top it off they’ll arrive in vintage limo from one of our great wedding vendors. I’m also arranging to have one of my talented photographers do a small photoshoot with the guest and winner to capture the special weekend. How would you describe Ceremony? The same as The Lodge! Luxurious yet unpretentious. Traditional yet very modern. Beautiful yet attainable. I personally love to experience the finer things in life, but my midwestern roots will always keep me humble. And I think that shows in the weddings we showcase, the professionals we feature, and the couples who read and love Ceremony. Want to escape on a romantic weekend in sunny California with your sweetie? Enter our Golden Issue Giveaway for a three day trip to La Jolla for you and a guest at The Lodge at Torrey Pines. Pro tip: visiting the Golden Issue page in your Sweet Paul magazine each day will get you even more entries.